Lock in a great price for Secret Garden Tulum Hotel – rated 8.8 by recent guests! The property is beautiful! We stayed in a bungalow and the bathroom was the best part. The whole room was spacious and clean. The staff though was the best part! They were so friendly and helpful, definitely the best part of Secret Garden. The host is nice and explained us a lot about Tulum and the area. I love how attentive the staff is, very responsive and helpful. The cleanliness of the room is great, and the bed was very comfortable! Excellent staff were eager to provide tips and directions to anything from transportation, sights, and of course restaurants...all of which turned out great. The location was ideal for us, an oasis just a short walk from the main strip. Would definitely stay again. It’s a nice, cosy place. Located couple streets away from the main city street, it’s easily accessible, plenty of eating joints around. Not big on frills but this place is pretty quiet, has good security, clean and has good basic amenities. Jorge, our host , is very friendly and has been very accommodating. 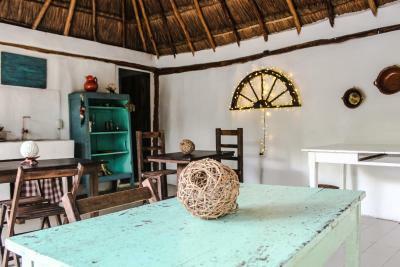 He offers his knowledge to suggest the best sights and sounds Tulum has to offer and places to eat. 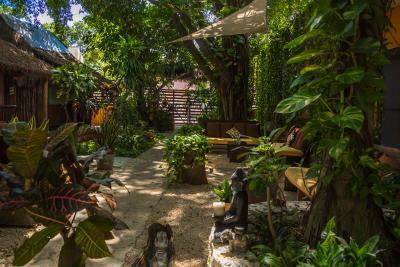 Secret garden is only 2 blocks off of the main street in Tulum Town and was a little quiet haven away from the bustle. Everything is close by and the ADO bus terminal was close enough to just drag our suitcases to it. The garden is pretty at night with candles. Birds wake you up in the morning and it sounds like you are in a jungle. Very cool. We booked a bungalow which was a nice size. Would definitely book again. Got a helpful introduction to Tulum from a staff member, who showed us some top local picks on the map upon check in. Great service. Rooms make good use of the space, tastefully decorated and garden is super relaxing. The courtyard is a dream- comfy day beds surrounded by greenery! You can hear the birds chirping and fully relax however you choose. Everywhere is very clean. Room and bathroom were perfect for us- simple but nice. Great location. We hired bikes and rode everywhere including to the beach and cenotes nearby. I would definitely recommend. Lovely little hotel with a nice garden where you can sit and relax. Nice, clean room and very helpful and friendly staff. Wish we could stay longer! It's a short walk from the main strip (5mins), great taco place just around the corner and bike rental place few minutes walk as well. It takes 15-20 mins to cycle to the beach or 5 mins by a taxi. 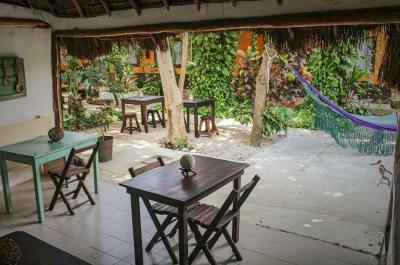 Secret Garden Tulum Hotel This rating is a reflection of how the property compares to the industry standard when it comes to price, facilities and services available. It's based on a self-evaluation by the property. Use this rating to help choose your stay! 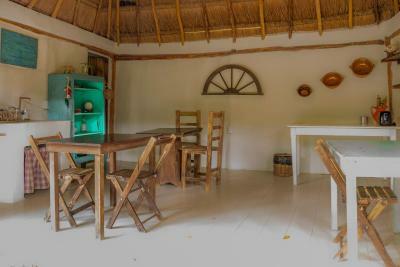 One of our best sellers in Tulum! Secret Garden Tulum Hotel is in central Tulum, but in the middle of a tranquil space decorated with local made furniture and featuring free Wi-Fi and tropical gardens. The hotel offers coffee and snacks all day long. 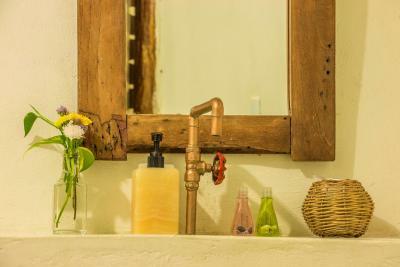 Each room is decorated with typical handmade ornaments and minimalist décor, and has air conditioning and private bathroom. Some accommodations may have a fridge and a kitchenette. Beach towels are provided by the hotel. 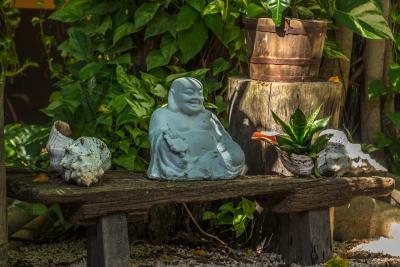 Secret Garden Tulum Hotel is 2.5 miles from Tulum National Park, and guests are able to find restaurants and shopping within walking distance. 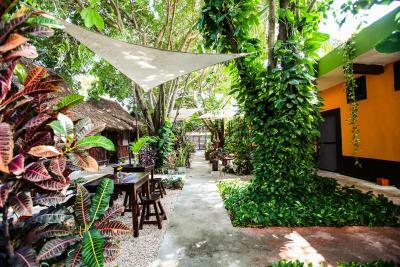 When would you like to stay at Secret Garden Tulum Hotel? The Standard Room has air conditioning, a ceiling fan and a private bathroom with shower. Ideal for a single occupant or a couple traveling light. 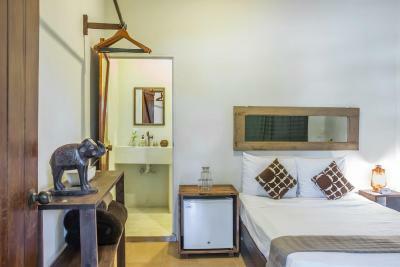 The spacious room has air conditioning, a fan, and a private bathroom with shower. The Bungalow has ceiling and floor fans, mini fridge and a private bathroom with shower. It features Mayan Style with thatched roof. This superior room features air conditioning, mini fridge and a fan. We opened in August 2009, the culmination of a dream of escaping the city and buildings a life in paradise. We want to create a home away from home for savvy travelers who find their way to one of the most beautiful beach destinations of the world. 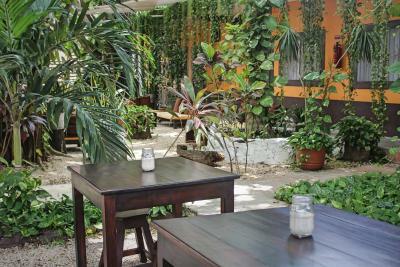 Hotel surroundings – This neighborhood is a great choice for travelers interested in archaeology, Mayan ruins and snorkeling – Check location Great location - show map Guests loved walking around the neighborhood! 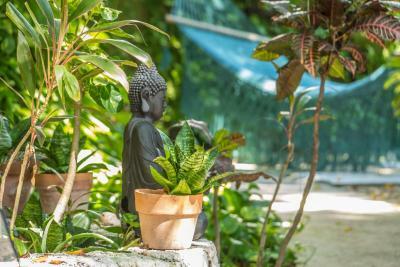 House Rules Secret Garden Tulum Hotel takes special requests – add in the next step! 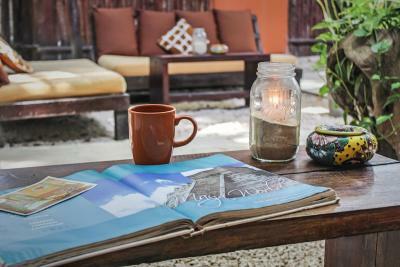 Secret Garden Tulum Hotel accepts these cards and reserves the right to temporarily hold an amount prior to arrival. Check-in is from 14:00 h to 21:00 h. Out of time guests must contact the hotel to advise. Please note that in certain seasons a minimum stay of 5 night will be required. Main issue was that the room (bungalow) didn't have an air conditioning, although it was indicated for all rooms on booking.com. The rooms only have fans. We wouldn't have booked it if we knew in advance. We stayed here for one night in between bus journeys. Great location close to restaurants, shops and bus station. Incredibly helpful and lovely guys run this place, we'll go back next time we are in the area, highly recommended. 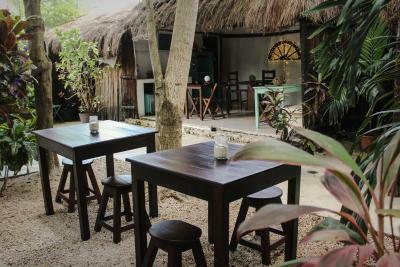 We had a great stay in secret garden tulum. The room was very clean and the shower is a big plus. Jorge is a very friendly and helpful host. He gave us some good recommendations on where to go and what to do. There is a beautiful patio/garden to hang out. We would stay there again without any doubts. Drains in bathroom smelled a little, would notice after a shower if you reentered room but either the smell left quickly or you got used to it so not really a problem. Air con and fan in room, room spacious, stylish and cleaned daily. Bathroom good size. Courtyard/garden lovely to relax in. In general we were satisfied with all that they offered us. Maybe if we have to find something the bed was too small for us! Jerry and Matthias were super welcoming and helpful, they suggest us a lot of place and things to do to escape that mass tourism. The room was really well equipped with fridge, some plate to prepare your own food and amenities. We loved this place because you can walk to the centre of town and yet the courtyard makes you feel like you are in an oasis of greenery. The rooms were clean and we had a warm welcome by staff. 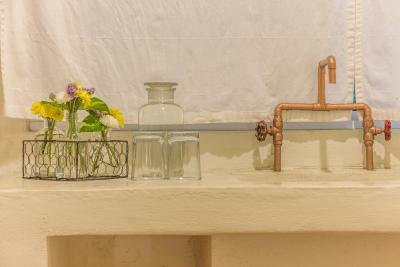 Secret Garden was well located just off the main road and was self contained, which made for a peaceful atmosphere. The garden itself wss a nice place to sit and relax with large trees and vines. There were also plenty of birds which gave us a nice dawn chorus. The beds were comfortable and we also had another mattress to relax on. Breakfast was nice with some excellant local bread. Staff were friendly and helpful and we really enjoyed our stay here.